In the third of a five-part series, Craig K. Chandler offers more tips for cutting your carbon footprint. This time: food and drink. Food – its production, distribution, preparation, and waste disposal – follows housing as a major source of carbon emissions. Agriculture in North America is heavily dependent on fossil fuel. It’s used to manufacture and power tractors and other farm machinery; make synthetic fertilizers; and process, package, and transport product. Fossil fuels also provide much of the energy for refrigeration, which is critical for extending the shelf lives of many agricultural products. 1) Choose tap water or filtered tap water over bottled water whenever possible. Transporting water from a local source through pipes to the tap is far more efficient than transporting water by truck (or ship, in the case of water shipped from Europe or Fiji). It takes a lot of fossil fuel to move trucks loaded with bottled water from bottling plants to the distribution centers to the stores where it is purchased. For those concerned about the quality of tap water: it is generally comparable to bottled water, in terms of safety. The federal government, through EPA, is charged with regulating water utilities, the suppliers of municipal tap water; and the Food and Drug Administration, FDA, regulates bottled drinking water. Municipal and bottled drinking water are subject to similar public health standards. However, EPA has broader authority to enforce these standards, requiring that testing be conducted by certified labs and that violations be reported. Because FDA considers bottled water a food, it cannot require certified lab testing or violation reporting. Also, water that is bottled and sold in the same state may not be subject to any federal standards. The manufacture of plastic water bottles is an energy-intensive process, requiring high temperatures and pressures. This energy is mostly generated by burning fossil fuel, and therefore results in the release of significant quantities of CO2. 2) Drink fewer bottled and canned drinks and juices. Like bottled water, bottled and canned soft drinks are heavy and require a lot of fossil fuel to move them from bottling plants to their point of sale. Also, just as with plastic bottles, the manufacture of glass bottles and aluminum cans is an energy-intensive process. For every calorie of energy in the food we purchase, there has been a certain amount of fossil fuel burned. Foods we buy but don’t eat still have used fossil fuel. Much food waste, frequently very heavy, ends up being transported by fossil fuel burning garbage trucks to landfills, where it is likely to undergo anaerobic (without air) decomposition, emitting methane (CH4), a powerful greenhouse gas that further adds to the carbon footprint. 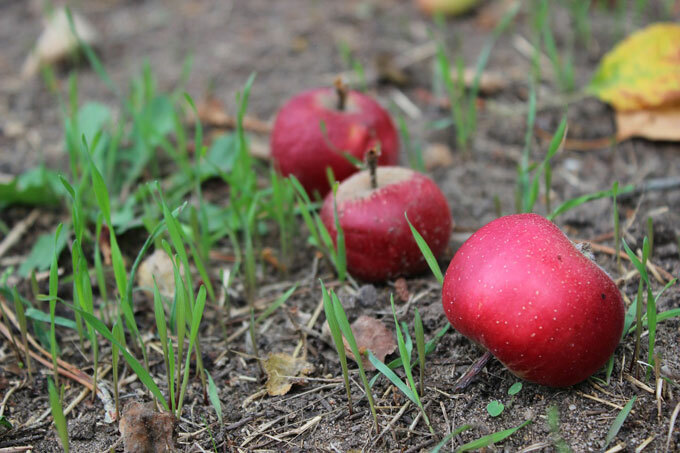 Plant-based food wastes (e.g., fruit and vegetable scraps, coffee grounds, and used tea bags) really are no different from the grass clippings, leaves, small twigs, and fruits and nuts wastes that fall naturally from the trees and shrubs in the yard. This waste generally breaks down quickly, creating organic matter that enriches the soil. Consider this simple system for handling a family’s plant-based waste. First, it is placed in a plastic bowl on the kitchen counter. Then that waste is regularly put into a five-gallon plastic bucket that has a screw top. (These buckets and screw tops are available at hardware or big box home improvement stores.) The bucket can be kept in a decorative canvas storage hamper in a convenient place. Once or twice a week, those contents of the five-gallon bucket can be disposed of into a shallow, freshly-dug hole or trench – usually in a discrete location. That food waste can then be covered with soil and a layer of leaves or brush. Earthworms and other soil-borne organisms quickly consume this organic material – and, voilà, dust to dust. In some cases, it may be smart to place some fencing around that disposal area – to keep one’s own or neighborhood dogs or other animals from digging into recently covered plant-based food waste. Animal-based wastes, including dairy products, can also be disposed of in a hole or trench, but these should be buried at least 12-18 inches deep to reduce the chances of attracting flies and rodents. 4) Consider issues related to pet ownership. Cats and dogs can be wonderful companions. But, like each of us, they have a carbon footprint. A medium-size adult dog requires 500-1000 calories of energy per day, and a medium-size adult cat roughly 300 calories of energy per day. Multiply those numbers by an estimated 70 million dogs and 74 million cats in the U.S. and collectively these pets have a caloric intake equivalent to that of roughly 30 million people, about the population of Texas. Granted, the traditional ingredients in commercial pet foods are byproducts of the livestock and grain industries (i.e., animal and plant parts not normally consumed by humans that would be considered food waste if not consumed by pets), but there are still significant additional carbon emissions associated with the manufacturing, packaging, and transportation of pet food.